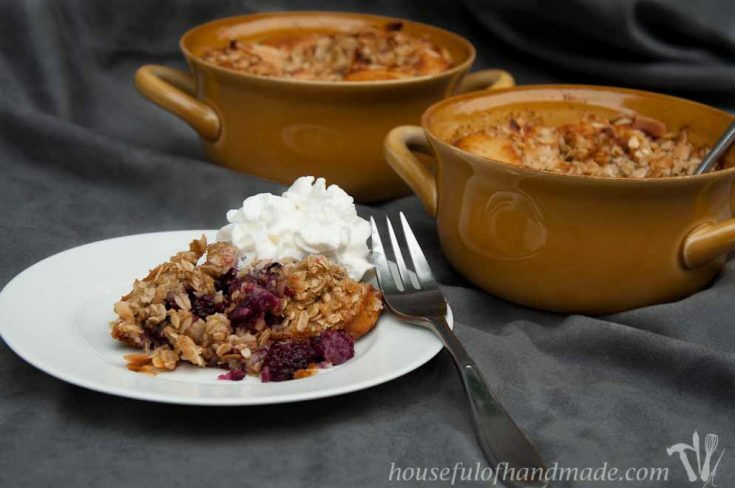 So are you a crisp or cobbler kinda person? I know some people love one or the other, but I have equal love for them both! After blackberry picking last weekend, I had a huge bowl of beautiful, juicy blackberries I needed to do something with. First I made this beautiful blackberry sorbet from Naturally Ella. It is amazing, you should try it 🙂 I’m still planning to make some blackberry sage jam for pairing with pork during the cooler months. And I knew I wanted to make a delicious desert, that’s what fresh berries do best. 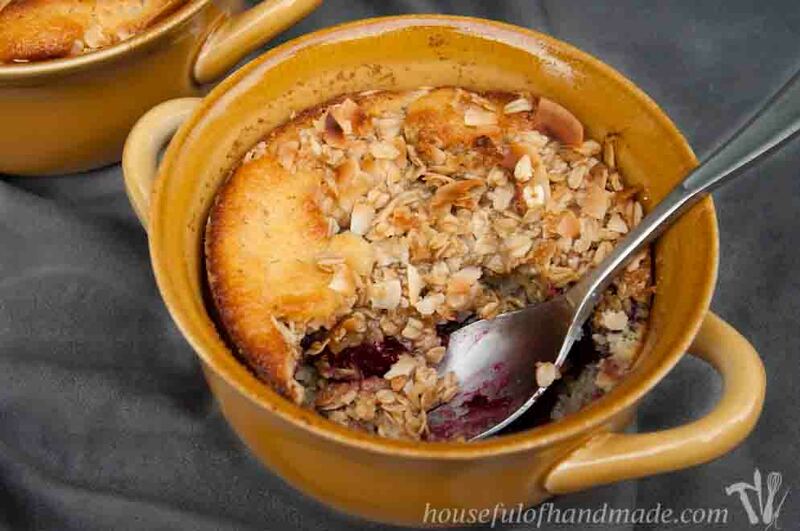 I couldn’t decide on crisp or cobbler to use up some of my fresh blackberries, they are both so amazing. So why not have both? And I am not talking about 2 deserts, but 2 deserts in one! 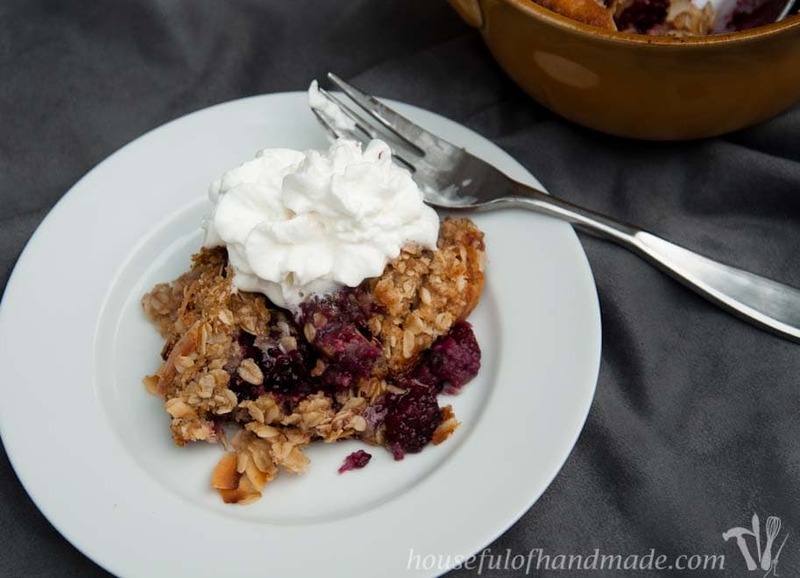 This blackberry coconut crispler is the best of both worlds: the soft cakey goodness of a cobbler combined with the oatmeal crust of a crisp, all mingling beautifully with the amazing fresh blackberries. This dessert definitely hit the spot for us on a cool, rainy day. It was warm from the oven, with whipped cream melting into it. But the fresh berries kept it bright for a still mostly summer evening. And I haven’t even mentioned the coconut! Oh, my! I added the coconut to the crisp topping instead of the traditional nuts. It was perfection with the blackberries. 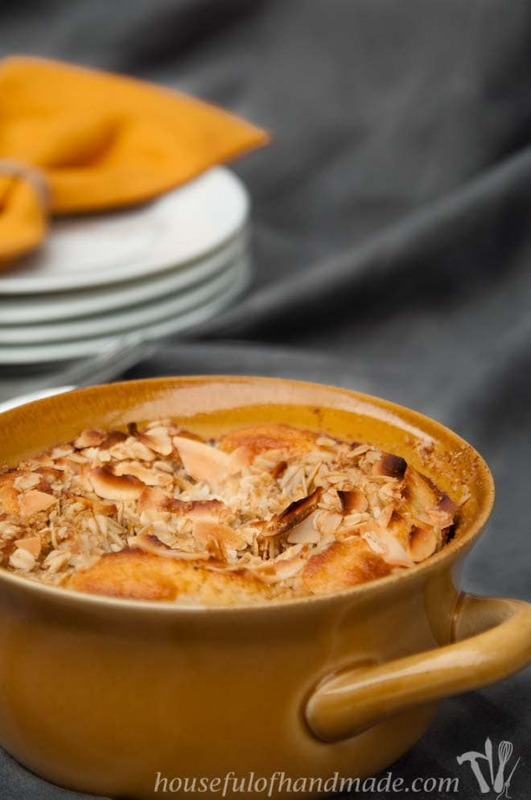 And the coconut toasted up so beautifully in the oven so it still gave everything a little crunch. 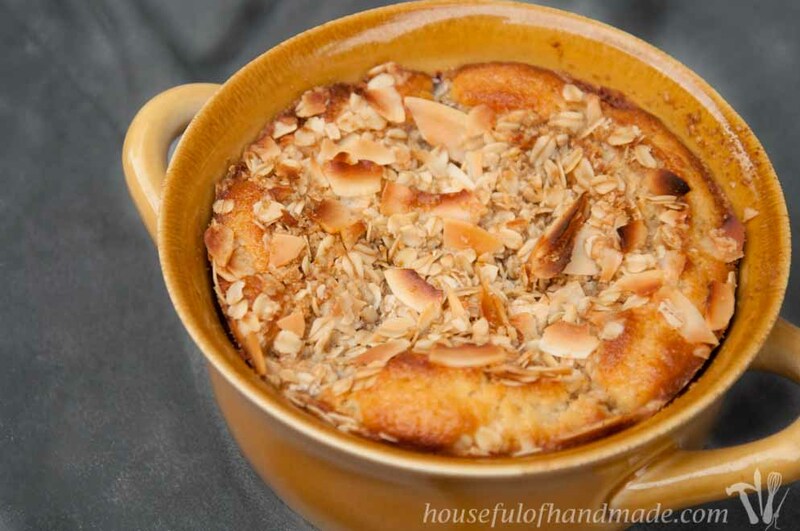 To make this crispler, you start by making the cakey cobbler batter. 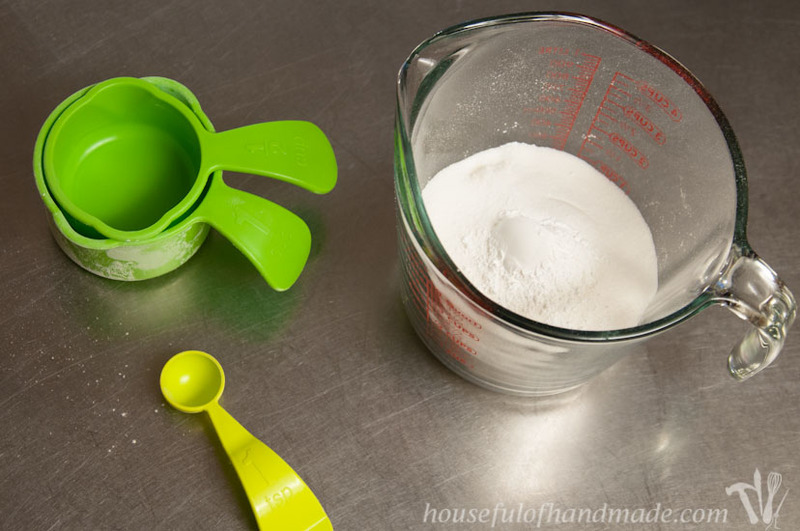 In a small bowl (or measuring cup) whisk together 1 cup flour, 1/2 cup sugar and 2 tsp baking powder. Set aside. Next, you will need 1/4 cup melted butter mixed and 1 cup milk. When I need melted butter and milk in a recipe, I like to melt the butter in the milk. It makes it easier to melt the butter in the microwave because it doesn’t pop and splatter all over, and then it saves time because I don’t have wait for the butter to cool before adding it to the milk so it doesn’t harden and get clumpy. 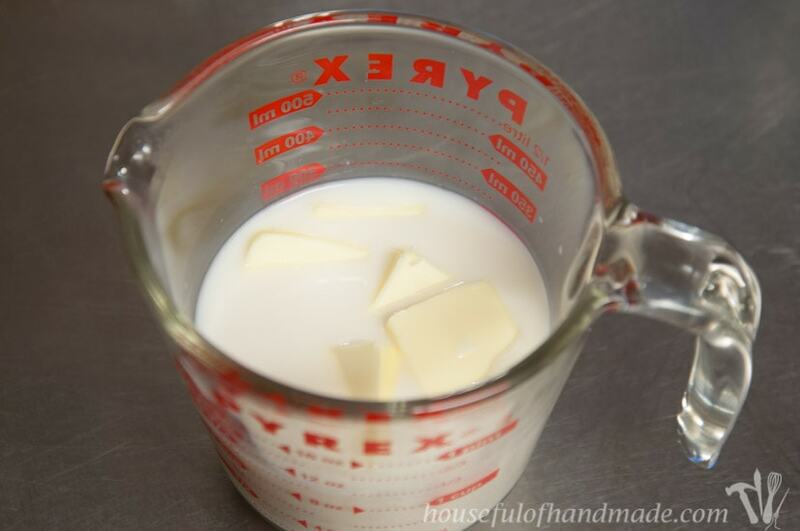 So in a 2 cup glass measuring cup, measure out 1 cup milk then cut 1/4 cup butter into small slices so it’ll melt without having to heat the milk too much. Heat in the microwave on 30 second intervals. I like to stir it after each 30 seconds so I only have to warm the milk enough to fully melt the butter. Pour the milk into the flour mixture and stir to combine. Then pour it into your medium casserole dish, an 8×8 pan would work too, or I used two smaller casserole dishes and poured half into each. Now sprinkle 3 cups blackberries over the top of the batter. And set aside while you make the crisp topping. To make the topping, you will need to cut 1/4 cup cold butter (or even better use frozen) into 1/4 cup flour and 1/4 cup brown sugar. I used my mini food chopper to quickly do this. 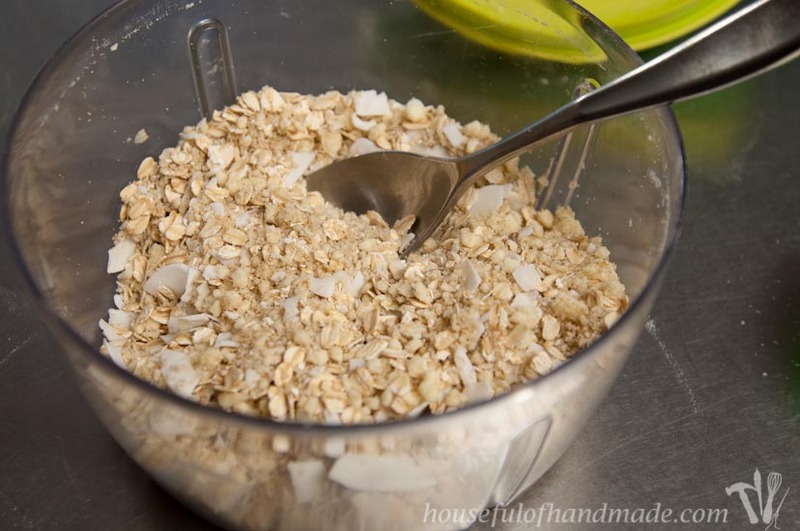 Then stir in 1/2 cup old fashioned rolled oats (not quick oats) and 1/4 cup unsweetened, large chip coconut flakes. 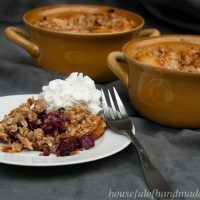 Sprinkle this over the top of the blackberries in the cobbler batter and your are ready to bake! Bake in a 375 degree Fahrenheit oven for 40-50 minutes (I baked mine for 35 in the two smaller casserole dishes) until a toothpick inserted in the center of comes out clean of batter (it will probably have blackberry juice all over it, yum) and the top is nice and browned. Let is cool a little bit, then serve warm with either whipped cream or ice cream melting all over the warm delicious blackberry coconut cakey, crispy, goodness! My sweet hubby thought I had made him a single serve size dish! Ha ha! I wasn’t about to let him eat half of it. And I am glad I made him leave some leftovers because it was just as good the next day. I can’t wait to eat this again as the berries continue to ripen and the nights continue to cool down. Happy Fall! 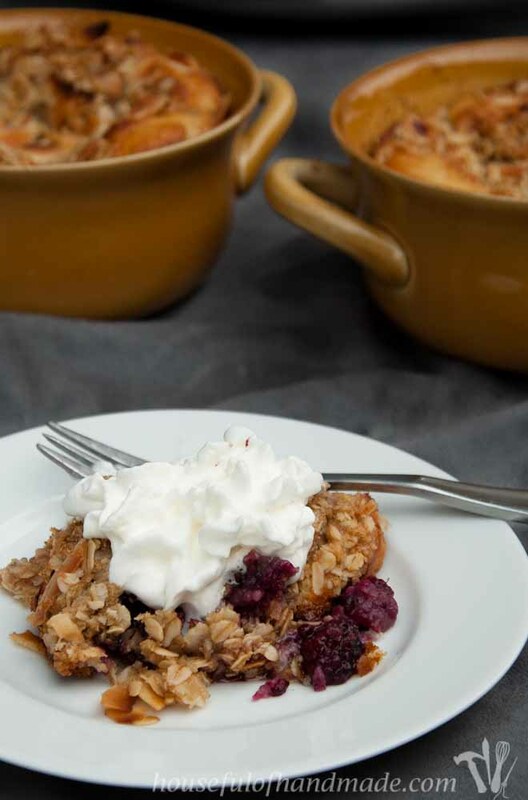 The Blackberry Coconut Crispler combines the cakey layer of a cobbler and the crunchy topping of a crisp with fresh blackberries and coconut for the perfect fall desert. 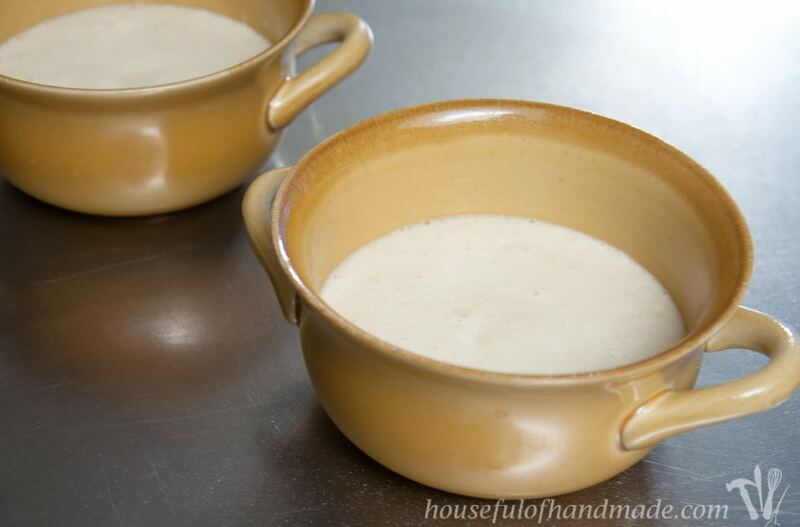 In a small bowl, combine the flour, sugar and baking soda. Cut the butter into small slices, add to the milk. Heat until butter is barely melted (do no boil your milk). 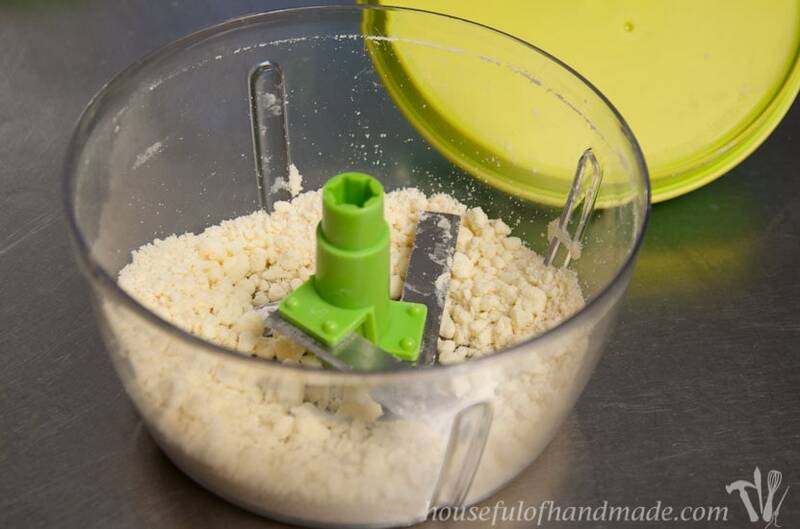 Pour milk/butter into the flour mixture and stir until fully combined. 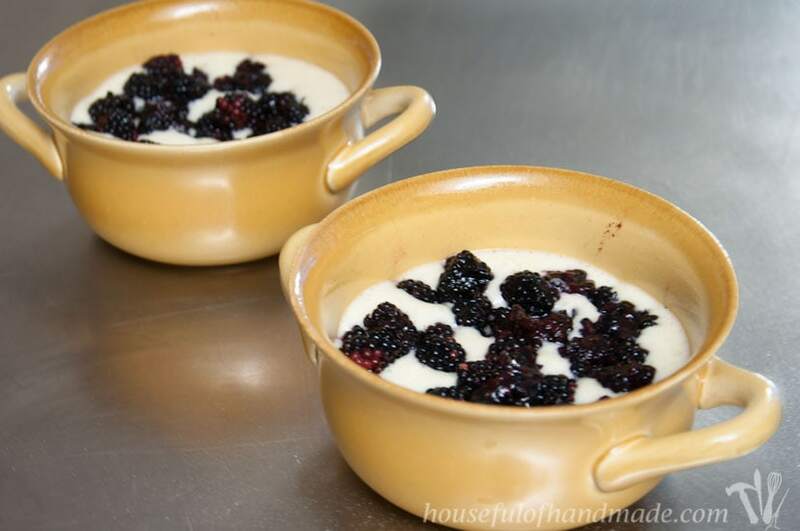 Pour into a casserole dish or 8x8 pan and sprinkle the blackberries over the top of the batter. For the Topping: Cut the butter into the flour and brown sugar. 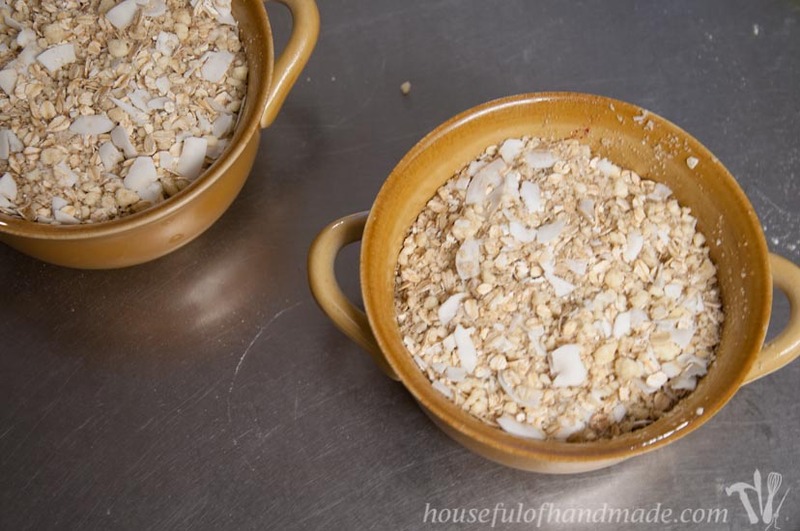 Stir in the oats and coconut. Sprinkle over the top of the blackberries in the batter. Bake 40-50 minutes until browned on the top and center is no longer gooey. Don’t you just love baking with fresh berries? Seems like pastries come out so much better. Blackberries are one of my favs, too! Thanks so much for sharing with us at Funtastic Friday. Fresh berries are so amazing! The blackberries were definitely delicious in this. It is YUMMY! I will be making this again and again. Thanks Kati. Thanks so much 🙂 I’m glad you tried it with all the blackberries you bought! These look delic!! Love your step by step photos! I’m drooling! What a great combo! 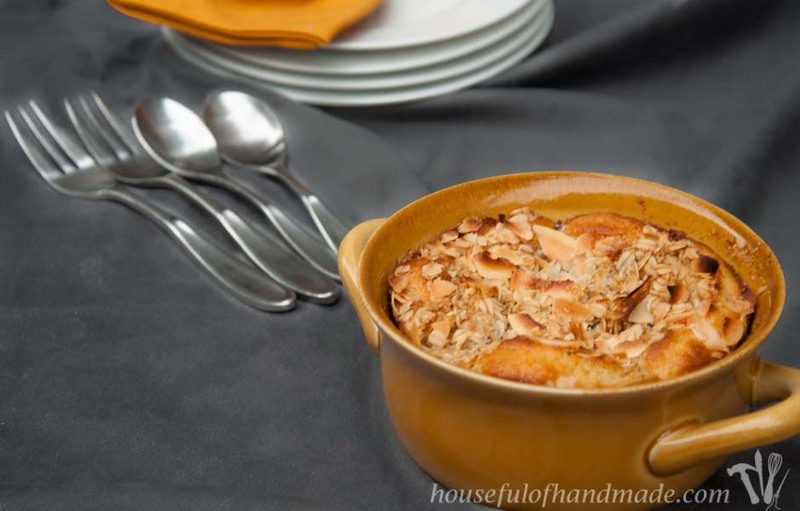 I love the idea of a cake and crisp together in one dessert. And you can’t go wrong with blackberries! Agreed! Blackberries are always a good idea. Yum! I love the combination of blackberries and coconut! What a fun idea. Thanks so much for popping over to my blog, I wanted to come say hi back. It is nice to get acquainted with you! Have a great day! Thanks for coming by to say hi 🙂 I found you on social media too! I love seeing everything you are up to. Yum! Our blackberries are done for the year, but luckily we have a few gallons in the freezer. This would be a perfect use for some of them!